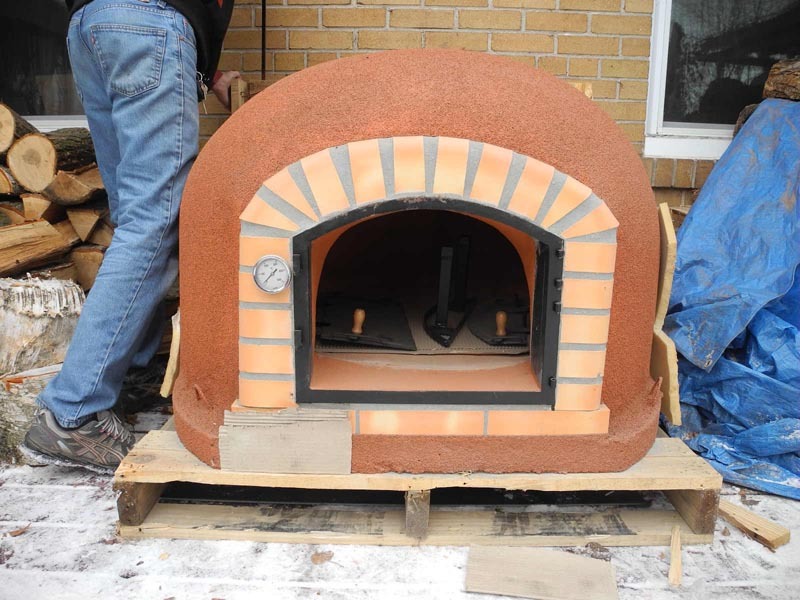 Getting a brick or clay oven into your backyard or on your deck does not have to be difficult, it just needs to be carefully planned. 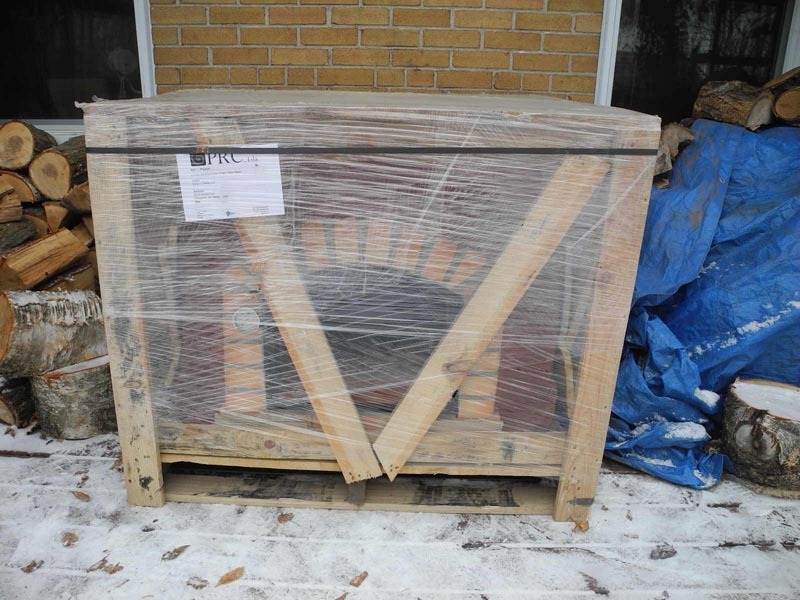 There are two main stages to the delivery process: a) getting the oven from driveway to where the oven will be used and b) lifting the oven onto your base. Watch how both of these can be accomplished with minimal physical efforts! 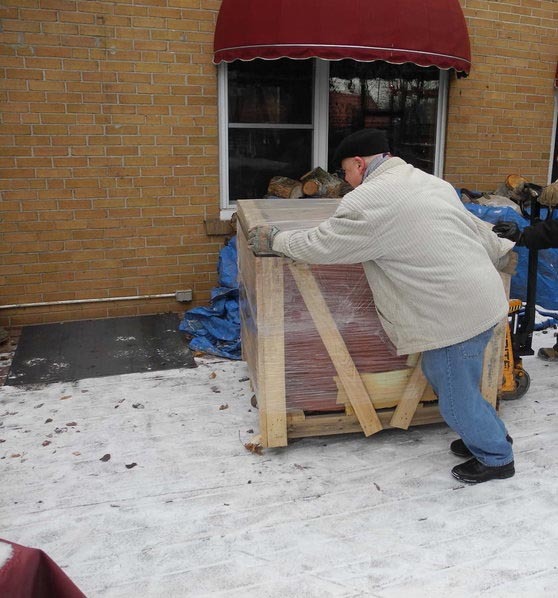 The oven arrives in the truck. We make sure the truck has a liftgate/tailgate to take the oven down on the ground. 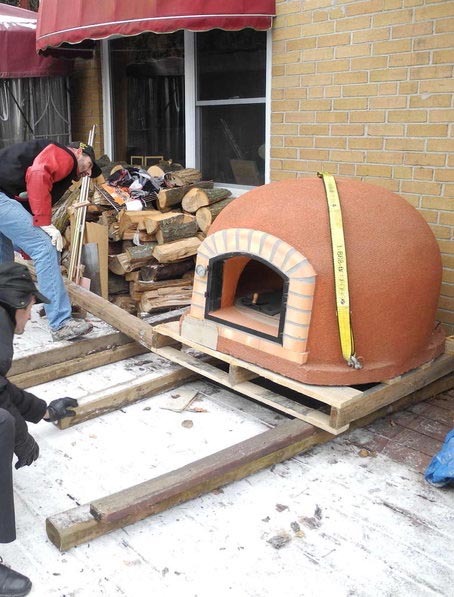 The oven is lowered onto the ground. Do not stand on or near the liftgate, the only one who needs to be there is the driver. If the oven is going on a deck make sure you have a ramp for the pallet jack, it cannot clear steps. Also make sure your deck can bear the weight. A good idea is to place sheet of plywood or metal to spread the weight as we are doing in this case. 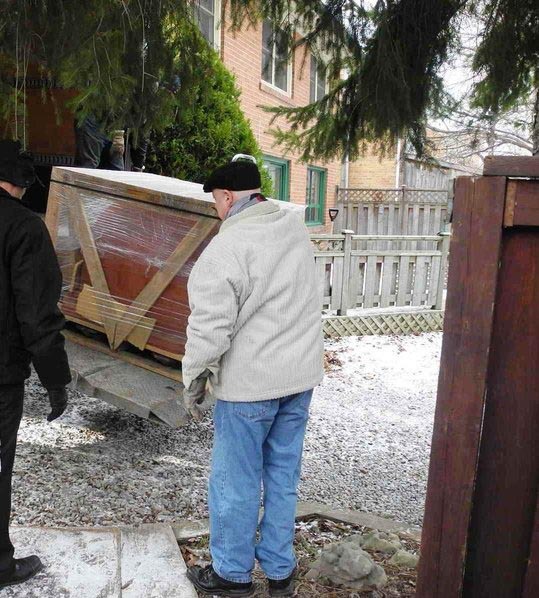 The wooden crate is removed with the help of a regular hand saw. 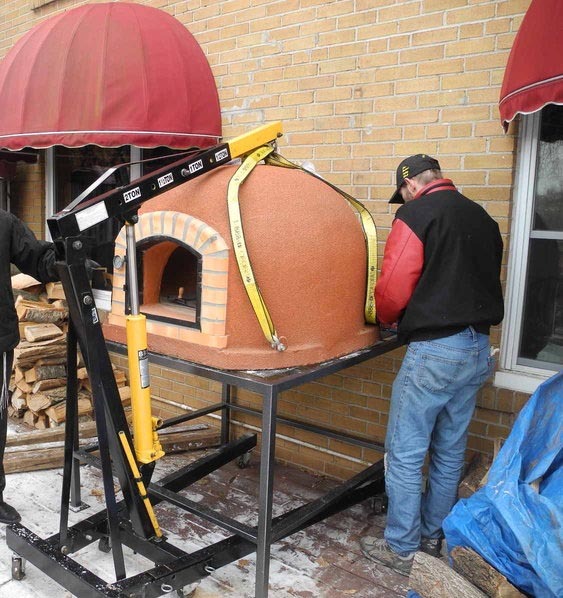 Now the oven has to be lifted, the stand slipped under it and then it should be lowered on the stand. Bring the engine hoist. You can rent it for $40 per day from a local tool supply company. Make sure it's capable of lifting at least 2 tons. Also make sure the reach (from the hook to the ground) is close to or over 7 feet. The engine hoist will not go under the oven, its feet are not wide enough. 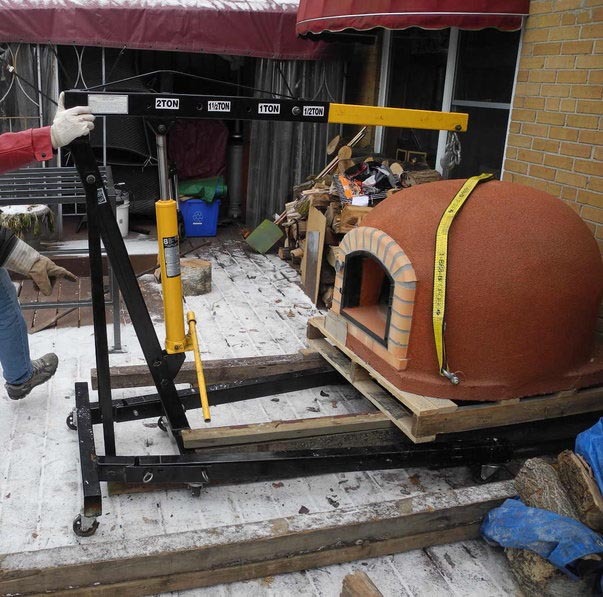 So... the pallet with the oven has to be lifted a few inches so that the engine hoist can be slipped under. Lift the oven. Make sure you use the appropriate setting on the hoist. 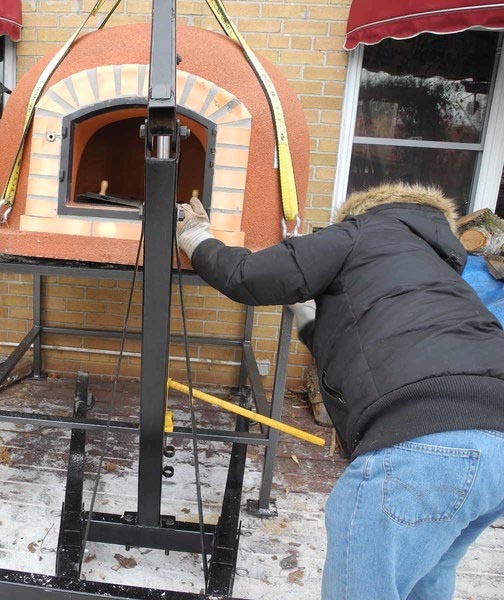 This depends on the weight of the oven. 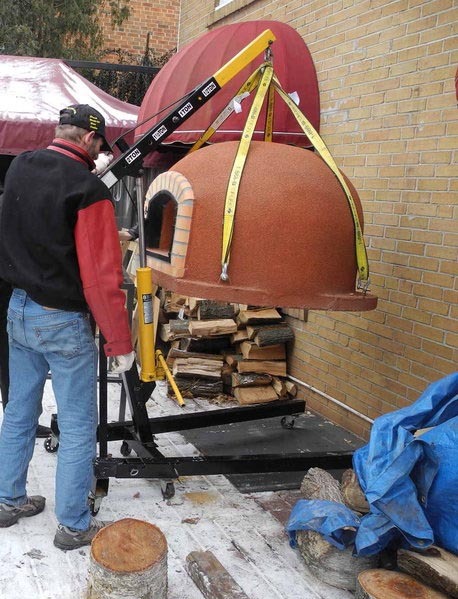 If the oven is 600 kg as in our case use the 1 ton setting. 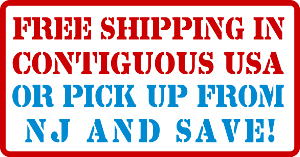 Also make sure you are using appropriate straps. Straps are better than chains because the latter can scratch the oven surface when they tighten up around it. I bought these 4 straps and shackles for approx. $100 from a local industrial supply shop. Each strap is rated for 2800 lb. This is an overkill, you would be fine even with 1500 lb straps. Whatever you do do NOT stand under the oven when it's hanging and do not move the engine hoist, it's only for stationary lifting. Place your stand underneath. We are using a powder coated stand custom made from tubular steel. Lower the oven onto the stand. We are done! Of course it helps if it's not -8C outside but what can you do if the party is tonight and your guests already got wind of your latest toy?! In the end it's worth it!